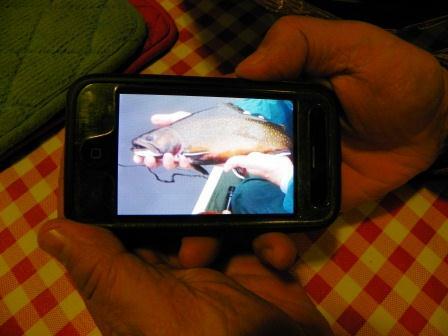 I have heard it said that the fin of a brook trout is the best bait to use to catch another brook trout. Pre-spawn, they stack up where the feeder streams come in, the males jostling for position and posturing for status, waiting for whatever signal it is that sends them streaking uphill to the spawning beds. In their finest fall colors, fins flick like flags and are nipped at in response, hence the logic of fluttering a disembodied fin through the pod. 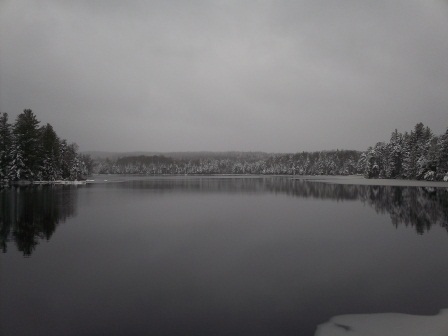 The issue of obtaining said trout fin in the first place was addressed — in a Gordian Knot sort of way — by those who tie flies, a notorious bunch of fussbudgets fine community of problem solvers. A few casts with a feathery fin fly were usually all it took to collect as many real fins as an angler could wish for. 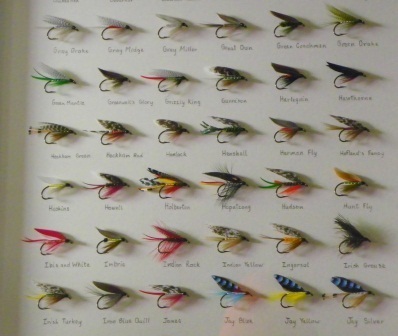 The wet flies in the photo represent the flies from a color plate used in Ray Bergman’s book Trout, first published in 1938, and were tied by Don Bastian. Don was a guest at Fish in a Barrel Pond this summer and was kind enough to let me try some photos of the reproductions he has done of the plates from Bergman’s book. Some people call this type of wet fly “fancy” and view them mostly as novelties from days gone by, but the fact remains that these flies caught fish way back when and they still catch fish today. One of my personal favorites is Queen of the Waters, fished three or four feet down, either alone or in tandem with another of its kind or perhaps something dark and shiny like a Coachman or Blue Bottle. The wings of my flies are generally malformed. My hackle leaves a lot to be desired, but that Queen of the Waters is particularly ratty because it has been chomped on a few times so I don’t think the fish really care. 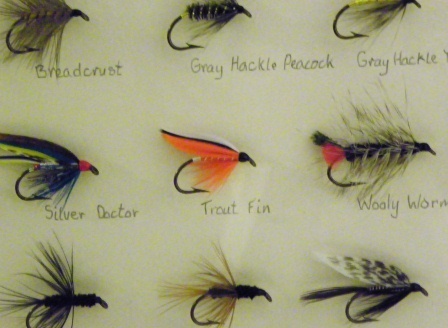 The wets I tie and fish are simple, practically rustic, due to my levels of skill and patience at the vise, but I would like very much to tie flies like the wets tied by Don. 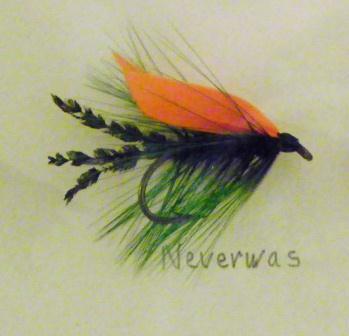 If there is not a wet fly called Nonesuch, there ought to be. 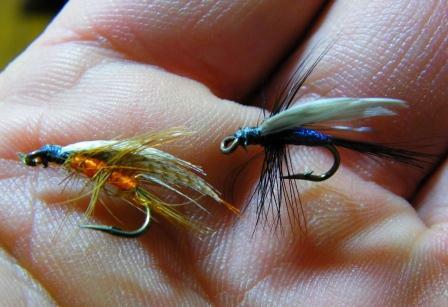 Some flies have both wet and dry versions, representing different stages of a hatch while others, like the Trout Fin are pretty straight forward in intent. Others may or may not be representational, reflecting whimsy and artistry as much as anything else. 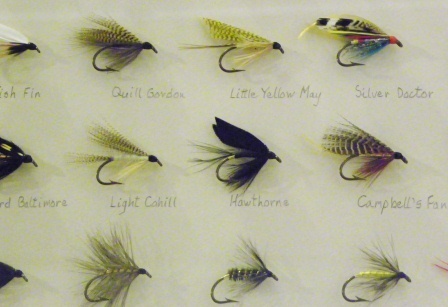 As with tying other types of flies, the tying of wet flies involves certain special techniques and the one that has always vexed me is the “marrying” of two or more colors of feather to get the stripes in the wings of flies like the Undertaker, Trout Fin, Silver Doctor and others. Don has it down pat. In fact, he has it down so pat that his technique is considered “Proprietary”. Don and his flies are quite well-known — at least among those who enjoy poking around in the dusty, romantic corners of our niche-filled pastime — and I’d sure like him to show me how he does it. But here’s the thing: Don puts an awful lot of time and effort into sharing his knowledge with others as it is. These flies are what he does, and I can only imagine how many times he has answered the same questions and gone through the same motions, again and again, for enthusiastic brothers and sisters of the angle. The poor fellow deserves a break, just like anyone else with a daily grind, and that’s our specialty here at Fish in a Barrel Pond, so while he was here I just shut up and let him fish. Sure, we chatted and made small talk when our paths crossed, discussing flies we might use in those conditions, in this spot, at that moment in time, but that was about it. I mean, if someone like John Gierach stopped by I wouldn’t ask him to bang out a few thousand meaningful words, and if Lewis Black came up for a weekend (as if) I wouldn’t ask him to do that funny thing where he scrunches up and gets all apoplectic about stuff. Heck, I don’t even take my old friend Dr. Marcus Feely up on the free digital exams he offers every time he’s here (“No trouble at all, Quill. I’ve got gloves in the car.”). Folks just don’t come up here to do what they do every day back home (most of them, anyway). That is a mighty fine square tail for these waters and not many that nice are recorded in any given year. Just look at those fins! Nicely done, Don. In case those bits of flattery aren’t enough for a free lesson on married wings, Don recently announced a forthcoming book titled The Favorite Flies of Mary Orvis Marbury, which will feature “replications of all 291 of the historic 19th Century fly patterns from Mary Orvis Marbury’s 1892 book, including written and in some instances, updated dressings in a fly tier-friendly format.” The exact publication date remains to be determined, but follow that link for information on reserving your very own SIGNED COPY of the LIMITED EDITION. I’ll be wanting one of those copies, Don. Of course I’ll also need another new (to me) old bamboo rod for tossing those flies you’re going to show me to tie because rumor has it that brook trout was caught on a wooly bugger. But don’t worry — your secret is safe with me. This Don guy sounds like a guy with entirely too much time on his hands. I’m guessing he also checks his knots and wears waders that don’t leak. In other words, a classic case of OCD. What’s this about “checking knots”? I think that getting Don to admit he “may be a tad of a perfectionist” is a good start on his road to recovery and he will always thank T.J. Brayshaw for it. Begging pardons, but no “recovery” is needed, IMHO, for me “being a tad of a perfectionist” with my fly tying. If I were not “detail-oriented” the flies would not be tied as they are, but would perhaps be sent elsewhere by the quality-control department, uh, a number of rungs lower on the ladder. Quill, certainly, the next time I visit Nonesuch Mountain, try to get your club duties sorted out prior to my arrival, block out some time, and I’ll gladly teach you my wet fly tying techniques, as much as you can absorb. I look forward to it…! Actually lately, I have not enough time on my hands. Going through a divorce, not enough hours in the day. The October trip up to Fish in A Barrel Pond was a short-notice serendipity that was resulted from an invitation from a member. A wonderful respite from my problems here in Pennsylvania. I do check my knots (because when I haven’t I’ve lost enough nice fish to know better), and currently, my waders don’t leak (the last time I wore them), but I know the feeling; and I may be a tad of a perfectionist when it comes to my fly tying, but I guarantee you I don’t have OCD. Thanks for your comment, and I appreciate you took the time to read Quill’s post. I followed the link here just now from my blog. I got a few laughs out of this article, including your comment. Quill; next time I’m there all ya gotta do is ask, or not, since I already know you’d like a little mentoring on married wings (best part – no latex gloves!). The trip to Weston was great because it tied in perfectly with a preliminary visit to the Museum in Manchester, where I began the process Quill mentioned, related to my upcoming book. Appreciate your comment! Don, I’m glad you got a few laughs. I’m looking forward to your next visit, and I will be following the progress on the new book. I hope others will, too. I took it to mean, ‘Obsessive Compulsive Disorder,’ which was the one I knew. I like your Old Codger Disease much better, and I can admit to having a touch of that…! Ain’t such a bad thing… LOL! i’m quite fascinated by this eating fins business and how it (maybe ?) relates to winged wets. never heard that before and will do some research. can’t help it man, this inquiring angler wants to know ! That undertaker is a beautifully tied fly! Don certainly seems to have a knack for tying wets. I am truly impressed. As for Dr. Feely , he seems like he’s very devoted to his profession or else has an unhealthy attraction to bearded bloggers from Vermont. Always a good read Quill! 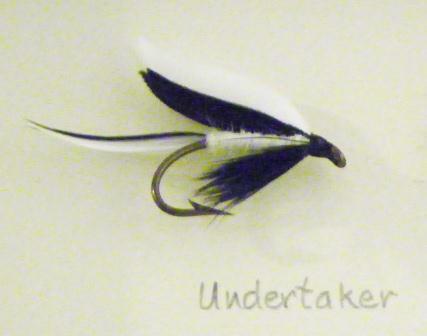 The Undertaker is a very striking fly and caught my eye right off the bat. Doc Feely is, how shall I say it, enthusiastic? Thanks Quill for a great post. I love those old classics and admire Don’s work as well as Mary Orvis Marbury. Happy Thanksgiving! I knew a “classic” like you would appreciate those old classics! Good stuff Quill, thats a beautiful place you guys use over there. Dons flies are almost too nice to tye on a leader, but brook trout are worth it! Howdy, neighbor! Not to put too fine a point on it, but I need to keep clear that those guys use the place; I just try to keep it from falling apart. They are beautiful flies but I bet there is a certain sick satisfaction at seeing them get mangled by the trout. Old Codger Disease was better, I think. Regarding all those wets, I seem to be seeing a lot more about wet flies these days, perhaps because I’ve started dabbling in tenkara and its somewhat different (e.g., reversed soft-hackle) patterns. I’ve also noted the popularity of the DVDs and YouTube videos by Davy Wooten and Oliver Edwards (a couple of Brits) on upstream wet-fly fishing. A few years ago, imparting action to nymphs and wets was unusual but not so much these days. Imparting movement is another tenkara technique, incidentally. Beautiful…and classics become classics for a reason. Well, usually. 😉 Like Marc…I subscribed to Don’s site as well. Thanks, Quill. My pleasure, Erin. I’m glad a few more people are seeing Don’s flies and his blog. Random, wanton classics irk me a bit. Thanks for taking a look! I just added “55 on the fly” to my reading list. My parents had a set of camps in Oquossoc, Maine in the 1960’s and anyone up there who tied flies, tied a lot of wets. I was never that good at it but I caught fish. Recently I took a class with Don and I can tell anyone, you need to do this! What Don does is to teach on several levels at once, if you’re a beginner, he gets you started-with great technique. If you’re like me, he gets you away from the techniques that have been in your way and onto his methods which are faster, easier and produce great wet flies time after time. It’s even better than OCD, it’s the right method for a great style of fly, and that keeps us old codgers smiling. Hugh, Thanks for stopping by. The camps around Rangely are one of my special fascinations. If I was retired and had a time machine I’d go back 100 years and spend the rest of my life there. With your endorsement, Don’s not leaving next time until I get my class. Back in the ’60s, my wife, my college-age daughter, and i spent the night in a motel in Rangely. I returned to the desk after checking in and inquired as to where he owner recommended we get something to eat. With an accent to go with “You can’t get there from here,” he said, “Why the restaurant would be the place to go for that, I reckon.” Pressed for further details, he allowed that he thought its name was The Red Onion, but he was not sure of that. A nice town. I knew I was in Maine. I made a note to return for the fishing. Reading this again – I just thought of a reply to your comment…maybe next time I’m up there I’ll dawdle a little on teaching you to tie wet flies, maybe that way I’ll get to stay longer and fish more. Thanks for your kind comments! I wanted to let you know, perhaps Don C. told you, but I have been booked again at the L L Bean Spring Fishing Expo, and am looking into booking more classes up there in Maine around the dates of the Expo…he may schedule something at his new shop if the Penobscot Fly Fisher’s club does not. Anyway, I have feelers out there…pursuing these options. Thanks again for your compliments! Appreciate it! Nice to know I do something right once in a while…! Now I have another reason to be in Freeport this spring!